Here is a review of ‘The Transition Companion’ by Maddy Harland from the new edition of Permaculture Magazine. You can download a pdf of the page on which it appears here. Transition is now a worldwide grassroots movement that looks climate change and peak oil squarely in the face and dismisses the utter impossibility of endless economic growth on a planet of finite resources. It offers community based solutions to help people in villages, towns and cities adapt to the inevitable challenges of the oncoming reality of profound economic and social change unflinchingly and with a good degree of humility and good cheer. It’s a collection of recipes for building community, environmental regeneration, relocalised economies and so much more. Transition emerged from an energy descent plan process during an in-depth permaculture design course taught by Rob Hopkins at Kinsale Further Education College in the early 2000s and has since spread around the world. 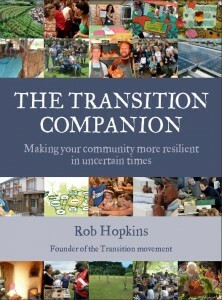 Rob’s first book, The Transition Handbook (2008), introduced the concept and explained how to set up Transition initiatives. It went down a storm. Other titles followed in the series – on local food, money, planning a Transition ‘timeline’, and how to influence local government with these ideas – by a variety of authors working with Rob and the other co-founders of the movement. Almost a decade of experimentation unfolded. This new volume offers stories of Transition initiatives from all over the world, plus practical Transition Tools for starting, and perhaps more critically, maintaining a Transition initiative. It’s an impressive collection of ideas and praxis. I read so many books about peak oil, the state of the world, and environmental degradation that I often glaze over. This one is different. It has authority born from practical experience, a musculature that is immediately engaging, even reassuring. It feels mature. The book is not afraid to catalogue the limitations and failures, even celebrate them, as well as the successes. I like the way the book was crowd sourced. Rob blogged on each Transition Tool and invited feedback and ideas. The participatory aspect brings it alive: here is more than one visionary man’s voice but a whole chorus of voices. There’s a good degree of futurecasting within its pages: stories from a future that has embraced transition, some not without their humour. As computer scientist, Alan Kay said, “The best way to invent the future is to predict it.” That’s exactly what this book aims to do. As a publisher, I like the physical design of the book. It is visually interesting and easy to read but what I really love about it is its honesty. Right from the start Rob says, “Transition is not a known quantity. We truly don’t know if it will work. It is a social experiment on a massive scale.” What I am convinced of is its validity and critical necessity. The strings of governments are pulled by vested interest. Individuals are lone voices. It is only when we gather together in numbers that we begin to tip the balance of power. Working to transform how we live as a species is the only work worth doing. I applaud Rob and his fellow transitioners for their global experiment and their vision of hope that have awakened so many people. As the old world crumbles, we need to test out new ideas, techniques and technologies. So many are contained here and are reported with the wisdom of experience. This is rich meal for a creative, alternative future. Good Luck to the book! Looking forward to having it read. More to the point – having “Companion” readily available at a time of current structural break down could and should help the willing in the society to have a positive vision and action patterns to follow, as it helped Cubans in early 90s to have transition plans worked out in their academia beforehand. Hello. Il the quote of Alan Key reversed by mistake? Really looking forward to getting my copy next week! It’s going to be helpful for all those Transition Initiatives looking to deepen their engagement with their communities and move to the next level. Anyone know if it is available in the US? No I think it’s the right way round: you start out by making a (computer) model of the world, that forces you to ask which components and processes are the important ones and how they interact. This is the difficult part, but once you have even just a vaguely realistic model, it’s trivial to predict which changes now will give you which future. Of course a prediction doesn’t necessarily come true, which means that building a model is always an iterative process with reality checks against the future that is taking shape. Good fun. Thank you and fun anyways.